Very clever concept. It's a novel told through a fictional scrapbook made up of real illustrations and clippings from the 1920s. I thought I would have a difficult time reading it as I'd be distracted by the images. It was easier than I thought but still a bit awkward when the pages were very busy. Overall, I liked the story. I did get bored towards the end. I really think someone should have checked the language for historical accuracy. It would have been nice to see some 1920s colloquialisms, there were hardly any. The 1920s had so many great terms and phrases (bee's knees, and how, Sheik, etc.) , I really wish they had been incorporated. 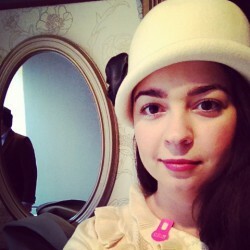 The thing that I disliked the most was when cloche hats were referred to as skull caps. I referred to them as skull caps back when I didn't know what they were so I can see how the mistake was made. As a cloche hate enthusiast, I really wish "skull cap" wasn't used. Even if "skull cap" isn't an anachronism, "cloche" is definitely more accurate. I could tell the author did a lot of research when acquiring the images and they all looked authentic. If you are particular about 1920s details, I would skip this book. 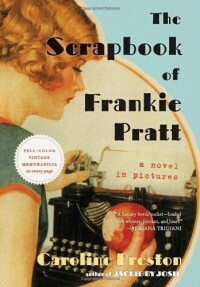 If you think an old-fashioned scrapbook novel would be a fun read, then I would recommend it.